Old filling: After some time, an old filling may begin to loosen, allowing bacteria to re-enter the cavity. Patients can strengthen teeth that were previously treated with fillings by opting for crowns. Large cavity: A crown is appropriate for treating a large cavity because it helps preserve the structural integrity of the targeted tooth. Root canaled tooth: Crowns are typically placed over teeth that have been treated with root canals to protect and fortify them. Broken tooth: A crown can help restore a cracked tooth, helping to alleviate pain associated with the injury and prevent further damage. 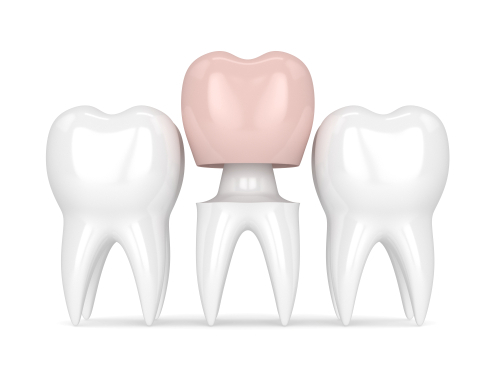 Bridges: Crowns are used to attach bridges, which are dental restorations that are designed to replace missing teeth. Dental implants: During the final phase of placing a dental implant, a permanent crown that matches the natural teeth is attached to the base of the implant. Regardless of why you need a crown, the procedure will likely span at least two appointments. During the first appointment, any decay or debris is removed from the affected tooth in preparation for the crown. The teeth are scanned using an intraoral digital scanner, and the scan is sent to a lab. A temporary crown is placed until the permanent restoration is fabricated. At the final appointment, the temporary crown is removed, the tooth is cleaned again, and the permanent crown is attached. For more information about crowns and other dental restorations, please call Gum Dental at 610.746.0488.